The Capitol Courier was the name of the student newspaper at the Capitol Page School when the school was composed of House, Senate, and Supreme Court Pages and when students had the option of serving as Pages during all four years of high school. The newspaper began in 1948 and was widely distributed on Capitol Hill. In fact, the paper made revenue by publishing advertisements from local merchants. The last issue of the Capitol Courier newspaper was in 1981. 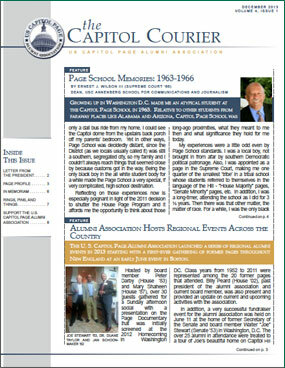 Although there is no current student newspaper of Congressional Pages, the Capitol Page Alumni Association has brought back the name for its alumni newsletter, which features in each issue a combination of news, alumni events, historical tidbits, and alumni profiles. Do you have a memory you’d like to share? An experience with a Member that was inspirational, funny, or unexpected?